Comments: Our Scout troop is planning our 50th anniversary reunion, and as part of our archives, we have found some pics of Gailard Sartain from his time in Troop 26 in the mid-50s. Thought you might like to see them. I must be showing signs of forgetfulness. Was Jack O'Brien Mayor? I know he served as a Commissioner for years but didn't ever recall him being Mayor. Do you recall what years he served? I know Maxwell was Mayor for years then I recall Bob LaFortune getting elected. Oh well. If you don't recall the years maybe I can locate the info elsewhere? Comments: Here are two late 2003 articles I found about Beef Baloney. They are leaving the air after this Saturday night and could really use your help to be able to continue. Comments: Mike B., I loved your post about the CICADA INVASION! I can't beleive how paranoid people are about it up in DC! I remember, as a kid in Tulsa, every summer evening the soothing "buzz" of the cicadas in the maple trees in my old neighborhood (off of 61st St. near the hospital). Those things were everywhere, much like the ever-present June bug. It will be interesting to see the unfolding of the "invasion" and the peoples' reaction to it up there! Comments: In the DC area - some of the media almost warns ya to lock up your Volvo, big red dawg and children in FEAR of ***THE CICADA INVASION***! I have not seen such balderdash in a long time. There is a Cicada Phobia here with shrinks talking about them on radio! What is this country coming to? Heck - most places in DC they haven't even come out yet! People are scared they will creep inside theirs Beemers and Benz SUV's here and clog up the engines or eat their fan belts while screaming down the Beltway at 85mph in a 65moh zone! Oh, the horror! We are having a rush on netting to cover trees with (the factory ran out of net) and now a rush on cheese cloth.... (ya know cheese cloth does NOT taste good with ham on rye...)...Gov. Ehrlich of MD has named them a state insect as someone noted their bodies contain all the colors of the MD state flag! Its like we expect them red-eyed devils to march across the country gulping down trees. Yes, they can be noisy if you sleep with your windows open - but to me they are a comforting loud sound. And a comforting reassurance of the continuity of life. I can remember so many times in my 53+ years of where I was - when they came previously. My late, great surrogate next door neighbor grannie - Mrs. Baron - first assured me as a semi-toddler that it was okay to play with them and that they would not bite me. They and lightning bugs in a Mason jar with a perforated lid, were some of my first "captures". I remember being as sad when they died - as with the series of Woolworth's purchased canaries and parakeets that paraded thru my kiddie years. So I say, WELCOME! I hope to be around when they come again! Comments: Speaking of Froggy Burnett, I have some old footage of him singing at Lakeview Amusement Park. My dad took it at night so it is pretty dark but I will try to get it on the internet sometime this summer. I think I mentioned once before that part of the lodge out at the old Skyline was made out of the big rollercoaster, which was the world's longest at one time. Scared me to death, that is for sure. I have a short section of railroad track from the old park. It is nice to have a little souvenir. Comments: I was reading about the amusement park comments - Skyline was owned by F. H. "Red" Cox and operated during the 50's and 60's until it was brought by Farris Saffa in '69 when it became Indian Nations Park. I remember going with my parents to some American Airlines picnics at the park. It had a really good roller coaster as I remember. Tulsa has had many parks including Orcutt (Swan Lake), Electric Amusement Park, Crystal City, Lakeview, Bell's and others. However, does anyone remember the old Golf Patch, a small amusement park and driving range located at 41st and Peoria about where the shopping center with the Wild Oats market is now? Good memories of some of these during the 50's. Jack Frank has some film of that 41st and Peoria golf course on one of his Tulsa Memories videos, "Stuff That's Gone", I believe, available at Steve's Sundry. A little more about the other parks at the Oklahoma Historical Society site (a link given earlier in this Guestbook). Here is a postcard of Orcutt Park from 1910. Comments: Pat Brady just said that "Take Me Back To Oklahoma" was a Monogram Western, not a Republic film, and since I need a ride home in Nellybelle, I'll have to agree with him, gol-dangit. Location: Out by the corral, dagnabbit! Comments: Alas, the western channel doesn't have my favorite Republic B pic scheduled in the next month, "Take Me Back to Oklahoma" starring Bob Wills and the Texas Playboys. As an actor, Bob was a mean fiddler, if you know what I mean. I also think KOTV's Wayne Johnson is playing the sax on horseback in that pic, though the print I saw years ago was so bad, it was hard to tell. Comments: Not sure if the webmaster has mentioned this, but Beef Baloney's last new episode will air this Saturday night at midnight on Fox 23. The show is extremely funny and locally produced, it will be sad to see it go. Unfortunately, the young guys who make it have done so almost entirely with their own money, and with very little advertising. They're accepting donations at www.beefbaloney.com, I hope that enough people feel strongly enough about local TV to give what they can. Thanks, Erick, I have mentioned this on the Bulletin Board and the Beef Baloney page. As you say, they are very funny and deserve all the help we can give them. Comments: I stumbled across the 1937 Gene Autry movie, "Rootin' Tootin' Rhythm", on the Starz Westerns channel (Cox 152) last night. I got to see Al Clauser (Uncle Zeke) as a young man singing a cowboy tune with his group, the Oklahoma Outlaws. Co-star was a young Smiley Burnette, who, much later, was the engineer of the Hooterville Cannonball on "Petticoat Junction". Smiley played a mean accordian in the movie. Comments: Skyline Park is now an upscale housing development named FIVE OAKS RANCH. It features a ski-lodge type building that serves as a recreation and events center. A large deck overlooks a beautiful lake. 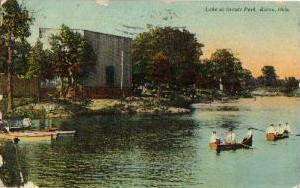 And when a worker there told me that lake was part of the old Skyline Amusement Park I was stunned. He pointed to where the roller coaster used to be and then I could picture the old park. There's a small building there - kind of rickety now - that was once a concession stand. If you go east on 121st off the Beeline you'll see the entrance (a small stone pillar) on the south side...like between Elwood and Elm(? )...not the way we used to go to the park. Skyline Lake is about 3 miles south of the Jones Airport on Elm (which is Peoria on the west side of the river), then about a 1/2 mile east on 121st St. West. The lake had a sandy bottom when I was there in the early 60s, great for swimming. It's now a fishing lake. The Five Oaks Ranch site has a photo tour of the lodge on the lake. Comments: My parents bought a forty-acre property southwest of Sand Springs, in 1946. We moved there in '47. At that time, we had a wall-mounted, hand-crank telephone out of Sand Springs. Our ring, as I recall, was "2." We had a number, but the ring indicated which party was to answer. To place a call, we had to turn the crank and wait for an operator to come on the line. In the spring of 1950, I hitchhiked to Pittsburg, KS, to apply for a job at KSEK (The Keystone of Southeast Kansas) a 250-watt daytimer. My contact for the job was a guy who attended TU and who was working that summer at KOMA, in Pittsburg. His name was Hal Hamilton and his family resided in a wide spot in the road, named Weir, Kansas, which may or may not still be on your Rand McNally. I was supposed to call his home when I arrived in the environs, but I didn't have a phone number. I knew that Weir was small and I chanced calling the operator. She was very nice and asked what party I was calling. Hal's father was, let's say Len or Leon--I can't remember--and so I requested his number. "Did you want Len, Junior, or Len, Senior?" "Just for my information. What's Len, Senior's number?" "That would be 1," she replied. By the way: I got the job. Comments: I have some really old footage (1950's) of Skyline and Lakeview. I had promised these for viewing to Frank (Oklahoma Memories) but logistics beyond my control prevented me from doing so until now. I do have these very short segments transferred from 8mm to digital, along with a lot of other vintage Tulsa footage that my dad took when we were growing up (also known as homemovies). I will see if I can download some of it and get it up for people to see. Some of it is not bad. I was just by the Blue Whale and it looks pretty spiffy. In fact, it looked like some folks were utilizing it for an outing. I haven't seen Skyline since the early 60s, so I'll be looking forward to seeing your footage. Comments: The two-letter shorthand (LUther 2-9233 was KOTV's number back in the day) represented the central office where the line from your house terminated at the switch. The telephone company hereabouts, which has changed its name from Chesapeake & Potomac (which, as it is said about the King James Bible, was the way God dictated it), to Bell Atlantic, to Verizon, still uses the two letter designations in its routing of things like fiber between COs.
Oftentimes, the exchange words were tied to neighborhoods or landmarks (just about everywhere had a CEntral, for example), but dial telephones meant sometimes the exchanges were just words with the first two letters to fit the numbers. Finally, even more numbers mean the switch to seven-numbers. Now, here, we have to dial 10 digits for a local call. I can still remember two of my growing-up phone numbers--JAckson 7-7530 and VErnon 4-8988, which became 834-8988. I'm also old enough to remember being told, if a kid was scared and in a pinch, like home alone in a thunderstorm, dialing 0 would get you a real live operator who'd talk to you till you calmed down. Then there's the Post Office and Zip Codes, which is a whole nother story. My uncle once posted a letter addressed as follows: "Uncle Slick and Aunt Ethel, Iola, Kansas," which got delivered just fine in three days. In fact, weren't the exchanges designated by the two letters plus the first number, e.g., LUther 2 or SUrfside 6? Comments: David....I remember going to Skyline in '59 for a hayride. Go here for the story. The Blue Whale was still in Catoosa as of a couple of years ago. Neither Steve Powell nor Chris Lane. Who? Can't tell you. A short time ago, somebody wrote of early pizza efforts in Tulsa. As I recall, the first attempt was by a group that included later Tulsa mayor Jack O'Brien, in 1954. Guys coming back from Korean-era service had encountered pizzas in various places and thought they would sell in Tulsa. Jim played the part of Zeta, on Satellite Six at KOTV in the 50s, and like Paul Harvey, is a product of Miss Ronan's speech class at Central High. Comments: I just saw that a Bronson Harley Sportster MPC model kit sold on eBay for $258.00. Did you bid on that, Mike? Too rich for my blood, but I did pick up a nice image of a Bronson lobby card for $0.00. Comments: My number on the northside was FI 5-9774 (Fillmore) and I think there was a Cherry exchange (CH) over on Cherry Street but I could be wrong. I know that we used letters well into the seventies. Does anyone remember all of the old word-based telephone prefixes for Tulsa? I remember RIverside, WEbster, TEmple, LUther, and (maybe) NAtional. Any others? Also GEneral and HIckory...wasn't Owasso CRestview? Was there an AMherst, or am I going off the deep end? For younger readers, these were mnemonics for the first 2 digits of a phone number, e.g., instead of 437-2740, it was GE 7-2740. Tulsa phone numbers had been 5 digits, so when larger numbers became necessary (in the 50s? ), there may have been concern about how people would remember such a monstrous number. Of course, the phone system eventually outgrew the restrictions of the letter-based exchanges. 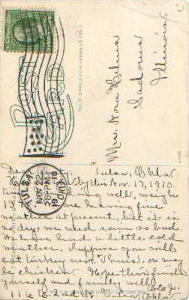 I found more about Tulsa exchanges in this item at batesline.com, which links back to an archived TTM Guestbook on a related Tulsa history topic: the notorious RIDESHY. Comments: Kinda looks like Steve Powell, OKC's "Foreman Scotty". Hmmm, here's a photo of Steve Powell in Tulsa around that time (I believe). The host pictured below looks older and different to me. Our Brownie troop was on this KOTV 6 TV show when we were in the 2nd or 3rd grade. We are talking way back in the early 1950's (1951-53). 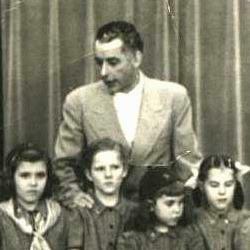 Sadly, no one wrote the names of the girls nor the name of the show on the back of this picture, and now we are hoping you might know something of the very early 1950's shows. KOTV does not know who he is! I've contacted them, and asked them if they might be able to identify the gentleman M.C. and the show, and they cannot! 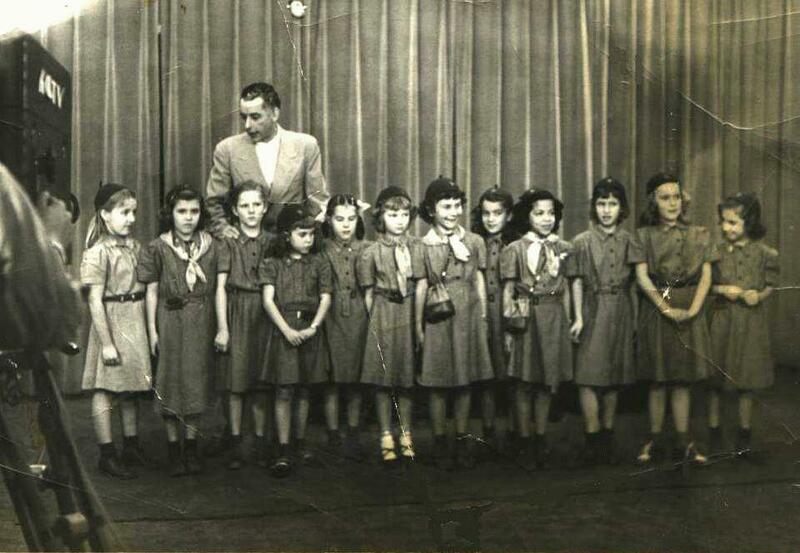 Hopefully you can be of help to us, our alumni group, in trying to name all of the girls in the group, and we'd love to be able to identify the show and the M.C. you see in the pic. I do appreciate any help you might be able to give us...thank you so much! The girls in this photo are of the Class of 1962, of Will Rogers & Central High Schools. The Brownie Troop was from Kendall Elementary School. Could it be Bob Latting from the Kids Karnival, or Chris Lane? Can anyone identify the host or any of the girls? "It does NOT appear to be Chris. It is not his hairline, for one thing." "I am 98% certain that starting from the right..
"2 Nancy Hawkins, 3 Judy Day, 4 Jonelle English, 6 Catherine (Kitty) Holloway. "These 4 girls are for sure CHS 61', not 62'. "There are 3 more girls that I recognize but I am only about 50% sure of their names. I'll take a look at some personal stuff I have and try to name them as well." Comments: I also recall the Sheridan Lanes roof collapse and thinking it odd they opened again so quickly. Never went there though, played all my pinball at Rose Bowl. The old neon Sheridan Lanes sign is still there, but now on the north side of the building. It depicts a fellow unleashing a strike in about 4 action frames. Comments: My friends and I hung out a lot at Sheridan Lanes bowling alley (31st & Sheridan), mostly to play pinball. And I'm remembering a time when the Sheridan Lanes bowling alley roof collapsed after a big snow storm. I think it would have been mid-70's. The strange thing I recall is how it seems like they had the place open again only a day or two after that roof collapsed, before it was even fixed. I remember going there when it was still snowy and cold and they had a big canvas hanging up in the place, and only a small part of the building open for business. We went there anyway, to play pinball as usual. Does anyone remember that, or have any pictures or articles about it? Seems to me that Civil Defense has no choice but to sound the sirens when the NWS says warning. I know I'd rather know there's a Doppler indicated rotating storm and hear the sirens than find out there's a tornado under there when the house down the road disappears. I was listening to KRMG whan those storms came through. I thought they handled it really well. Tulsa seems to have a really good warning system set up now, and I know those Whelens don't come cheap. Here in Memphis we have a veritable siren museum. Comments: Since it's been a few weeks since I've checked in, I'd like to touch on an item mentioned in the previous guestbook -- tornado sirens. I can understand that people become frustrated when the sirens are sounded and no tornado occurs near them. However, on each of the three nights that sirens sounded in Tulsa, confirmed tornado touchdowns prompted two of the warnings, and a tornado detected by radar prompted the other. I will agree that it was questionable for TCEMA to sound the sirens in central and north Tulsa for a storm that was over southeast Tulsa moving east. Having worked with TCEMA in the past as a weather spotter, I know for a fact that they have the ability to sound sirens for a specific area of town. However, as Mike McCool mentioned, they're prompted automatically by the NWS for whatever part of the county the warning is issued for. And to the poster who said the sirens were scaring elderly people...maybe they should! They should scare all of us into taking shelter. Severe weather coverage is such a touchy issue. If it's not affecting a certain person's area, they gripe about the fact that there's too much coverage. But they're also quick to complain that there isn't enough coverage when the stuff is hitting the fan in their neighborhood. I would rather have to see too much of Travis, Jim, Dan and Jon and know that I'll have the information than to be surprised by a storm. "Martha Stewart Living" (9 am, Channel 8) featured the Gilcrease Museum's Kravis Discovery Center today. If you missed it like I did, maybe the news will show some excerpts this evening. Also, Tulsa World writer Ashley Parrish has uncovered the actual recipe for Pennington's Black Bottom Pie. I'll see if I can reprint the article. Comments: If you would like an objective evaluation of the Borgward auto, ask Noel Confer who bought one in the late fifties and has probably never recovered from the experience. Comments: The readership here is exceptionally intelligent, and such folk often have strong political views one way or another. But if you have visited many forums, you will know that once discussion gets into pure partisan politics, there is little stopping a "flame" war. Here is the Guestbook "policy" I wrote in Guestbook 89, some 3 years ago. The gist of it is that politics and religion are polarizing topics not often relevant to this site. Please let's not go down the road of left vs. right or Democrat vs. Republican here. Every Tulsan owns the memories on this site, and I would hate for them to become polluted with bad feeling. That is not to say that politics/media-related issues do not merit discussion; they certainly do. I'll be looking for some sites with intelligent discussion of them and pass along the links. 5/19: Here is a site I believe is worthy of your attention: Spinsanity.org. This site dissects the manipulative rhetoric issuing from both sides of the political spectrum. The NOW with Bill Moyers site has many informative links dealing with media consolidation and a message board open to all comers. Strong statements abound on the board.